Often, the solution to a certain problem can be found right under your nose. When that solution is soaring high above your head, however, you might need a nudge in the right direction. 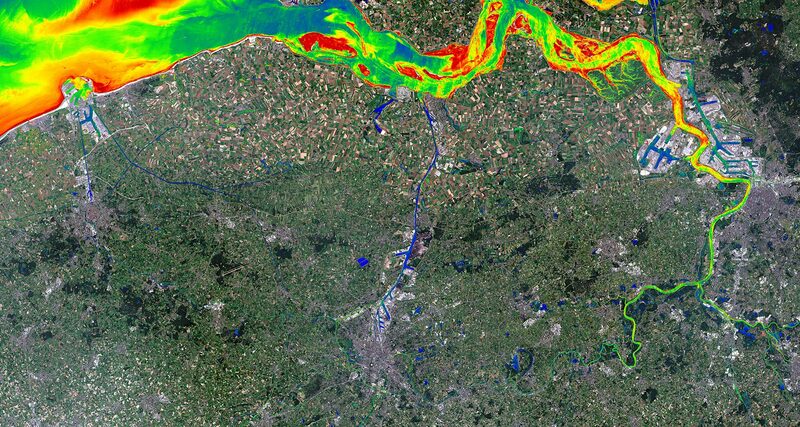 Discover how a satellite with a global orbit revolutionizes sustainable water management in the region of Flanders, Belgium. Satellite data like that of the Sentinel-2 can be used for a wide variety of applications. Suspended sediment mapping is one such example, and it’s particularly important for the Flemish and harbour authorities to track and improve the sustainable management of the waterway. It helps you to easily monitor spatial variations as well as subtle shifts over time, allowing you to gauge the results of your actions. There have always been ways of measuring and modelling suspended sediment for waterway management, so what makes using satellite data so interesting? This is where our people come in. By combining the right satellite data with the necessary image processing chain we provide a snapshot of the complete river in just a few mouse clicks. Using conventional methods, it would take weeks to cover the complete area. A snapshot in a few mouse clicks. It all sounds very easy to the end-user. As it should be. But behind those clicks lies a completely automated processing chain. It detects the presence of clouds in the image, corrects for absorption and scattering of atmospheric constituents and – of course – derives the suspended sediments in the river. This colourful map of the rivers in Flanders shows the suspended sediment concentrations. Red colours show the areas with the highest suspended sediment concentrations and the blue colours, mainly in the docks of the harbour of Antwerp, show the lowest concentrations.